The Georgia College Advising Corps seeks service-minded recent graduates to lead low-income, first-generation, and underrepresented students to college. We look for individuals from diverse backgrounds who are friendly, self-motivated, and passionate about our mission. The Georgia College Advising Corps works in underserved high schools throughout Georgia to increase the number of low-income, first-generation, and underrepresented students who attend and complete college. Advisers help students find their way to college by working one-on-one with high school seniors as they navigate the complex college admissions process, including researching college options, completing applications, and applying for financial aid. GCAC college advisers are members of the College Advising Corps and AmeriCorps. Advisers must have earned a bachelor’s degree by May 2019 and graduated from high school between 2013 and 2017. Advisers must have a strong desire to serve and be able to work well with diverse populations. To be successful in the role of college adviser, the following skills are necessary. Interpersonal Skills: Advisers must be able to collaborate effectively with others to achieve goals. Organizational Skills: Advisers must be able to meet deadlines, plan events, and keep track of data and records. Communication Skills: Advisers must have the ability to speak persuasively and tactfully, write professionally, and create multi-media texts such as flyers, presentations, and websites. Problem-Solving Skills: Advisers must be able to overcome challenges and solve problems creatively, ethically, and diplomatically as they help students navigate the college admissions process. *AMOUNTS FOR 2019-2020 ARE ESTIMATES THAT ARE SUBJECT TO CHANGE. Advisers receive preservice training during July at the University of Georgia’s Institute of Higher Education. During this month-long training, advisers are provided with housing, parking, and meals. Advisers receive training from expert professionals about college access, admissions processes, financial aid and scholarships, test preparation, and working with diverse populations. Advisers also travel to colleges throughout the state to gain expertise on postsecondary options available to Georgia students. In addition to the preservice training, advisers return to UGA throughout the year for on-going training. Advisers attend an all-expenses paid annual adviser conference. 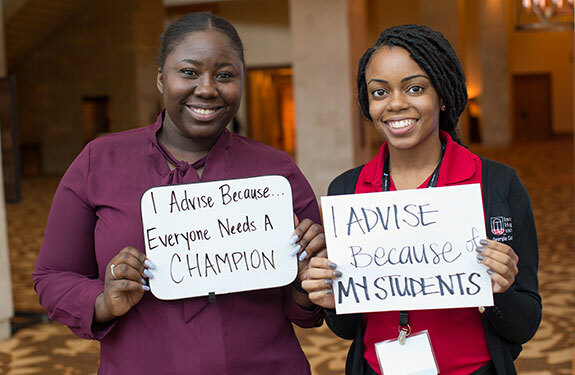 Advisers develop leadership, work, and life skills as they interact with K-12, higher education, and community-based organizations, developing knowledge and forging connections that will benefit them in their next step, whether that is a career or graduate school. Advisers enjoy the satisfaction of strengthening a community and transforming lives. Advisers work regular, full-time hours during the school year, following the site liaison’s schedule. This is an 11-month assignment. Training begins in the month of July and advisers begin service in their assigned school in August and end in May. Advisers may serve up to two years with GCAC if it is mutually agreed upon by the adviser and the Program Director. Please contact our program coordinator, Keia Dodd, with any questions you have about becoming a college adviser (keia.dodd@uga.edu) or fill out the inquiry form below. Subscribe to the GCAC Recruitment Listserv to stay up-to-date on our application process and get news about our recruitment events!